Today I decided to explore a part of Skomer I have never seen despite it being the number one destination for most visitors to the Island. Many come to the grassy cliff top plateau known as the Wick for close encounters with its particularly amiable colony of puffins, but I am more excited about the rocky ledges below the main attraction. 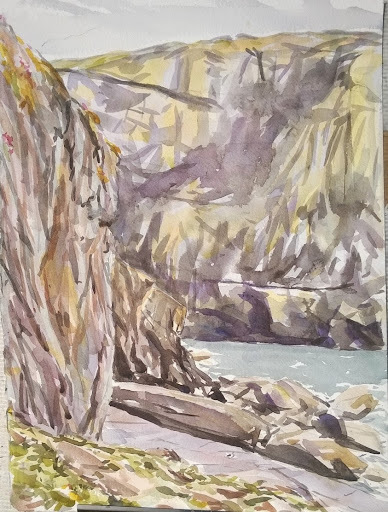 For the last three days I have been drawing guillemots in clumps on flat wide ledges and in the week before that more clumps on steep broad scree slopes. The Wick cliffs are different; they are sheer and flat with straight narrow ledges that underline neatly formed strings of guillemots. Amazing, that this slightly new type of loomery formation should seem so exciting to me, but after days absorbed in the detail of one site it comes as a revelation. With barely time to smile at the puffins whirring in and out of burrows around my feet as I carefully tread the path shown to me previously that leads past the boulder and into a shoulder width head high crevice. Squeezing through I feel like a pot-holer bursting into a forgotten subterranean world, the water is sapphire blue in a cavernous inlet; a hidden sanctuary away from the mingling puffins and puffin-lovers above, their hubbub replaced by the bustling of breeding kittiwake and guillemot clinging to the shear rock face, cutting the squeezed airspace with their lung bursting calls. I have often thought of the rhythm of drawing guillemot over again as being like forming characters in calligraphy. Seeing the groups of guillemot punctuating the wick cliffs in neat lines left to right makes this idea even more legible to me. So I begin to write guillemot, copying one of the ledges nearest me over in neat lines as an exercise. Each line takes between 7-8 minutes and I realise that this is a way of recording the changing structure of guillemot groups. A recurring theme throughout this project has been the way loomeries fluctuate in density at this period in the season, first during re-establishment of territory and later the sharing of incubation between pairs. I try this method in both ink and as a line drawings. Ink is fantastic, fluid and fast but less legible for what I want to do here – the line drawing works better to record the behaviours more precisely. The same ledge drawn repeatedly to record change. Later I explore further along the inlet out to sea and find a continuous ledge of guillemot, several hundred metres long. Evening spent painting studies at the Amos.